Explore the most tourist attractions of Cambodia including incredible Angkor Temple Complex, Royal Palace, Silver Pagoda ect. 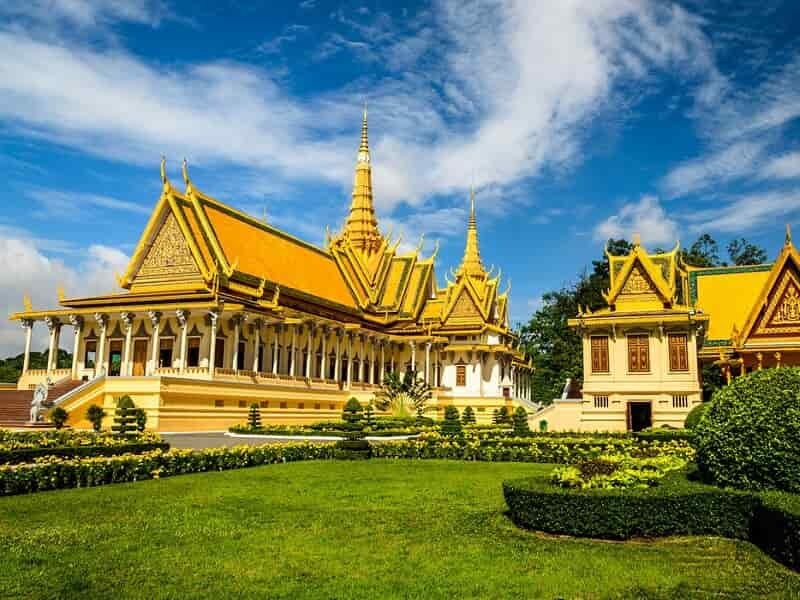 This fascinating Essential Cambodia and Vietnam Tour will offer you an exciting journey filled with culture, history and breath-taking architectures. Start this interesting trip from colourful, bustling Ho Chi Minh City, we then end it in Siem Reap. You will have wonderful opportunities to explore historic sites, colourful cultures, and the delicious cuisines when travelling in Vietnam and Cambodia. 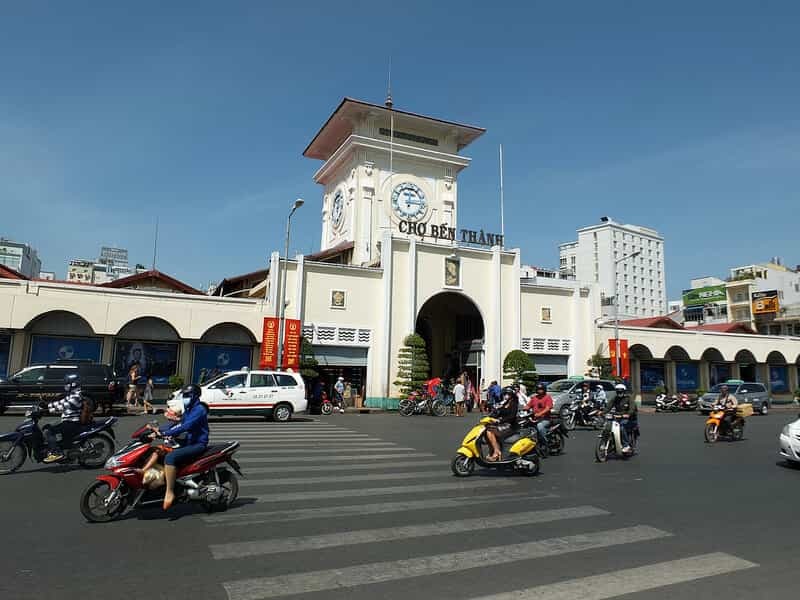 On arrival in HO CHI MINH CITY (or formally known as Saigon), you will be welcomed by our local tour guide and driver then be transferred to your hotel for check-in. Your guide will be happy to answer any questions about Vietnam along the way, and assist you with check-in at the hotel. For the rest of the afternoon, some soft sightseeing can be suggested based on your practical arrival time. OPTIONAL: After having experienced the frenzy of Saigon by day, discover the lively local streets by night. Join the locals then have chance to sample authentic Vietnamese food. Start the tour around 1830 and try “banh xeo” which is a large rice pancake filled with vegetables, shrimps and pork. The second stop will be made at the Tan Dinh Market for street food with a delicious local soup inspired by Chinese recipes. Next, it is time for a tasty “com suon non nuong muoi ot”, a local dish with rice and pork ribs. Cross a busy intersection, indulge yourself with a delicious dessert and a Vietnamese coffee. Wrap up the experience at a live music café playing traditional Vietnamese songs. Tour concludes around 10.00 PM. Overnight at hotel in HCMC (Saigon). 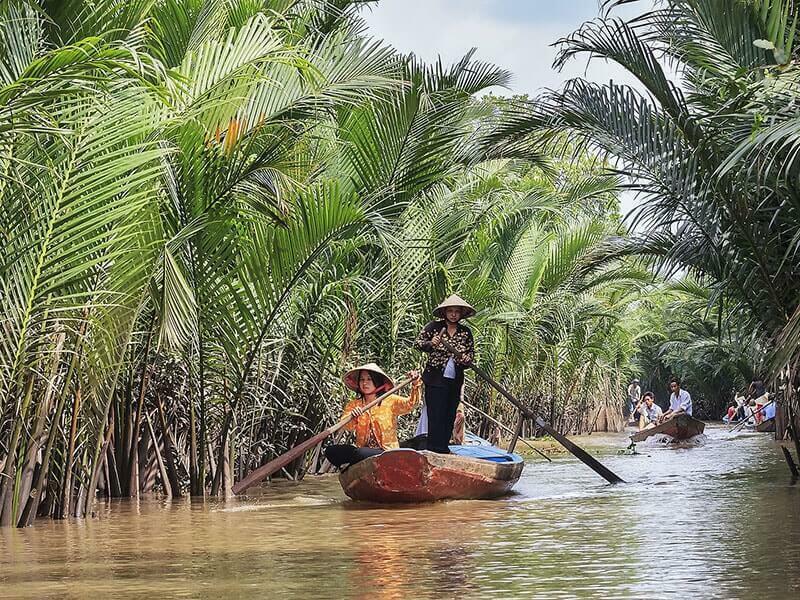 This morning, you guide and driver will pick up you then provide you with a 2-hour drive to the CAI BE, a region in the Mekong Delta Region, often referred to as ‘the rice bowl of Vietnam’. Cai Be is famous for its colorful floating market, vast emerald rice fields and lush back waterways. Upon arrival, board a local motorized vessel for the a day cruise in the delta’s waterways. Stop to visit a small handicraft factory on Turtle Island and to visit a tropical fruit orchard. There is also a chance to visit a cottage factory where ‘pop-rice’, rice paper and coconut candies are made. Later, take a horse-drawn cart ride along country roads, admiring the scenery and the daily life of the local villagers and enjoy a taste of the locally-produced honey, and explore the Xep Canal by boat. Lunch will be served in the local Mekong style with specialties of the area. After lunch we pay a visit to the Vinh Trang Pagoda, surrounded by beautiful gardens, in My Tho Town, before driving in the late afternoon to CAN THO and spend the night. Today is an exciting and busy day, as you rise early to visit the Cai Rang Floating Market in Can Tho. 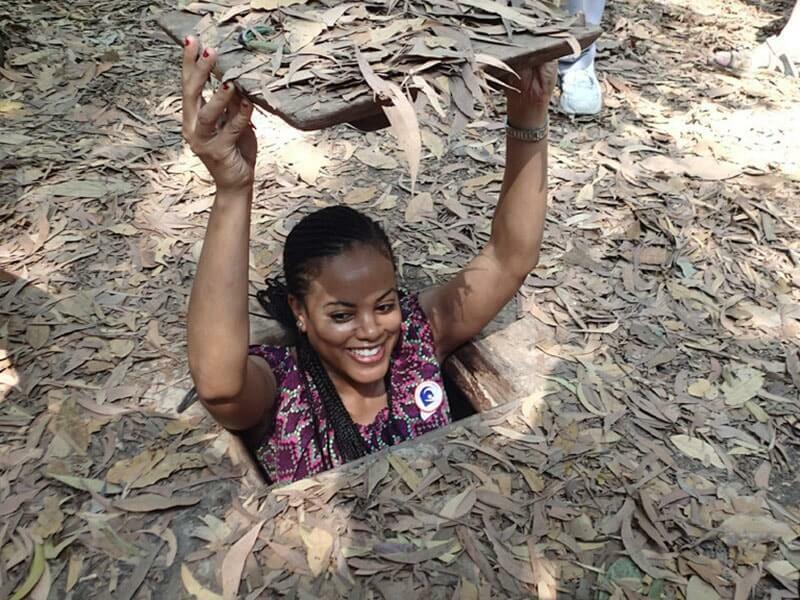 You then will retrace your steps back to HCMC, en route stop to visit the Cu Chi Tunnels, the remarkable underground tunnel network where Vietcong guerrillas hid out during the Vietnam War. Containing over 170 miles of networks and just 20 miles away from HCMC, the tunnels continue to burrow through the countryside, constructed deep enough below ground to not have been affected by rumbling tanks or aircraft. You’ll see secret trap doors, living areas, meeting rooms and underground kitchens while you can also view excavated areas if you prefer to remain above ground. Have lunch at a local restaurant near Cu Chi Tunnels. Late in the afternoon, return to HCMC, the city once known as Saigon, continuing its whirling energy, filled with vitality that carries you along for the ride. Begin our city tour in HCMC this morning with a visit to the Reunification Palace (formerly known as the Presidential Palace). This place was also where the Vietnam War concluded in 1975, when a Communist tank of the North Vietnam crashed through its gates. From the palace, stroll to the other major sights of colonial city of Saigon: the elegant 19th century Old Saigon Post Office, elegant artistry of the Cathedral of Notre Dame, Dong Khoi Street (formerly Rue Catinat), Saigon Opera House. Continue to the War Remnants Museum (or History Museum) where exhibition halls display imagery of both the French and ‘American’ wars. After the museum visit, pay a visit to the Jade Emperor Pagoda located on the fringes of District 1. The visit will gain you very good insight into local culture and belief. Return to your hotel for refreshment. 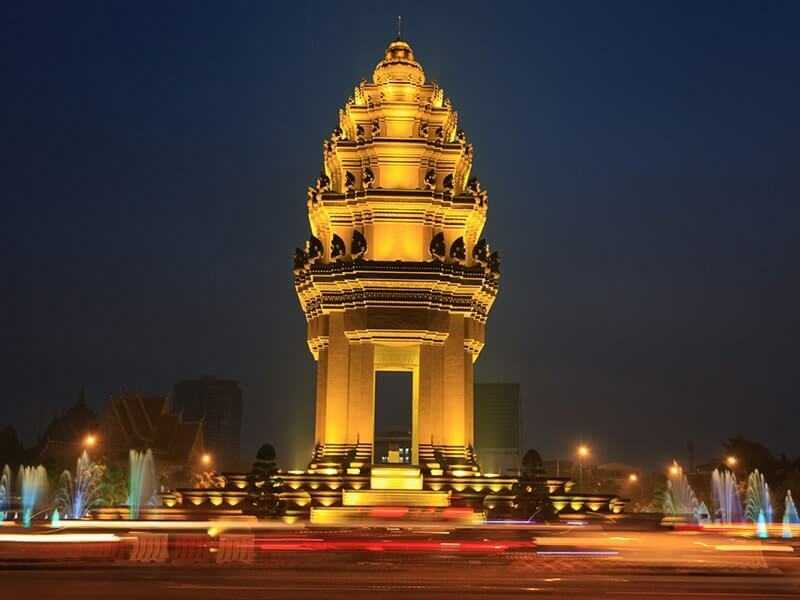 Depart Ho Chi Minh City this morning for PHNOM PENH, the city located at the confluence of three rivers, the mighty Mekong river, Bassac river and Tonle Sap river. For a long time, it has been a vital trading hub for whole Cambodia and region. On arrival in Phnom Penh Airport, you will be welcomed by your local Cambodia travel guide and transferred to the hotel for check in. After that, take an orientation tour with your guide. Despite its recent turbulent and tragic history, the city still retains much of its former colonial charm with wide, verdant tree-lined boulevards and classic colonial architecture buildings. 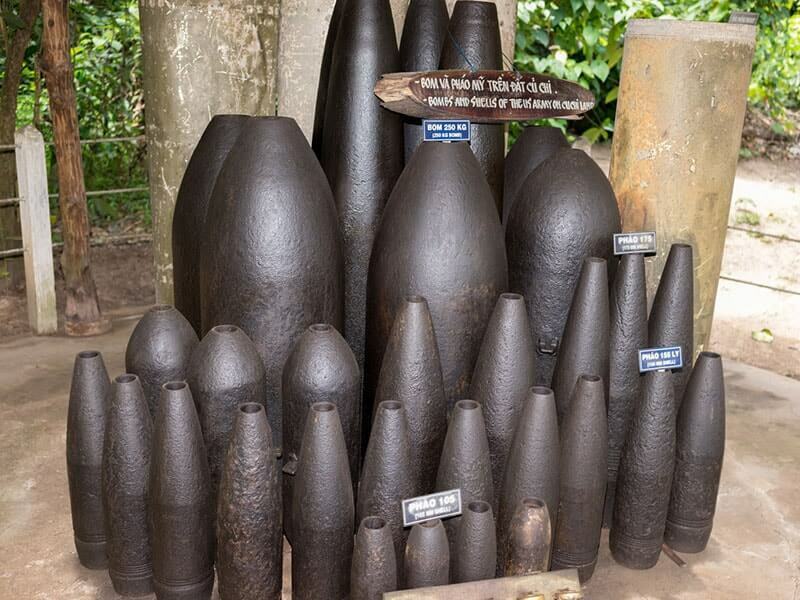 Firstly, head to the Khmer-style National Museum which is house of the world’s finest collection (over 5,000 pieces) of ancient Khmer artistic, archaeological, and religious artifacts from the 4th to the 13th centuries. Take a visit Royal Palace and Silver Pagoda which are the most popular tourist attractions in Cambodia. Inside the Royal Palace Complex, we will watch the collection of Buddhas in gold, silver, crystal, and bronze. Continue to the Tuol Sleng Museum and Killing Fields, which provide gruesome testaments to life under the Khmer Rouge and Pol Pot, the skull filled glass tower a vivid memorial to the 17,000 men, women and children who were murdered there between 1975-1978. NOTE: You should be aware that by their very nature Tuol Sleng and the 'Killing Fields' can be a distressing experience for some people. Late in the afternoon we will take a sunset river cruise along the Mekong river, observe daily life of local, enjoy the sunset view on the river while tasting a delicious fruit juice or soft drink. Then return to your hotel for relaxation. In the morning, catch a domestic flight to SIEM REAP, the charming gateway to the famed Temples of Angkor. Upon arrival, be met then transported by your local guide to the hotel for check in. After settling into your accommodation, begin our sightseeing tour by visiting the Angkor National Museum for an introduction of Khmer civilization’s art and culture. This archaeological museum is housing unique collections which are mainly dated from Khmer Empire's Angkor period from the 9th - 14th centuries. 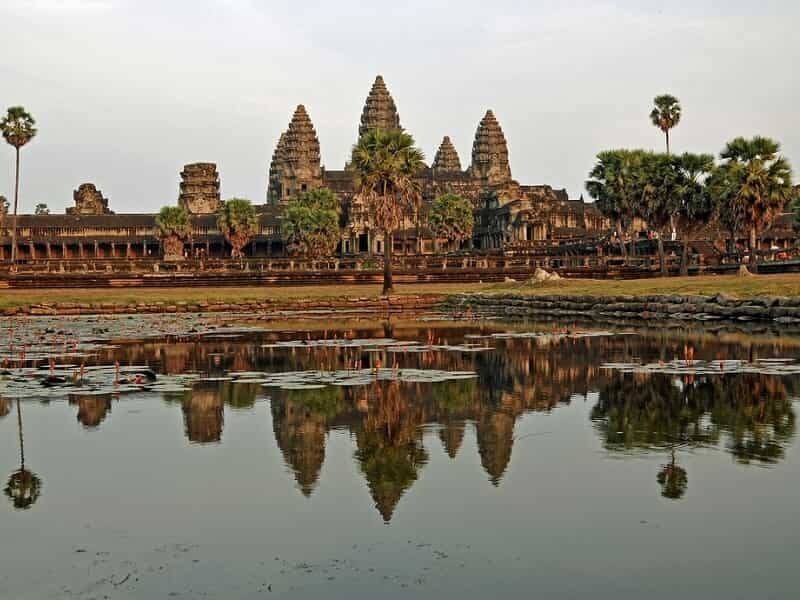 Next, visit the mother of all temples – iconic Angkor Wat which was built in the early 12th century by the Khmer King Suryavarman II and was originally constructed as a Hindu temple to dedicate to god Vishnu. It was constructed following the model of the temple mountain symbolizing the Mount Meru, home of the gods. At the end of the 12th century, it was transformed into a Buddhist temple. Inside the temple, we will see the walls are covered with stone carvings and bas-reliefs depicting Hindu mythology, the wars Suryavarman II fought during his reign and more than 2000 images of Apsaras and Devatas decorating the temple. In the late afternoon, pay a visit to Phnom Bakheng, a Hindu and Buddhist temple in the form of a temple mountain which is dedicated to Shiva. Phnom Bakheng is also well known as one of best place to watch sunset in Angkor Wat complex. Enjoy the panoramic view of surrounding countryside and the beautiful sunset over the forest. After breakfast, explore the ancient city of Angkor Thom, was the last capital and most enduring of the Great Khmer Empire under the reign of Jayavarman VII. From the South Gate, an impressive stone gate carved with elephants and four giant faces, head to the inspirational Bayon Temple which locates at the heart of Angkor Thom. This 12th century is well known for its impressive giant faces carvings and wonderful wall carvings telling the story of historical battles. Pay visit to the Terrace of the Elephants and Leper King. It would be great experience to keep walking through the maze and observing their wonderful, fabulous, intricate sculptures. 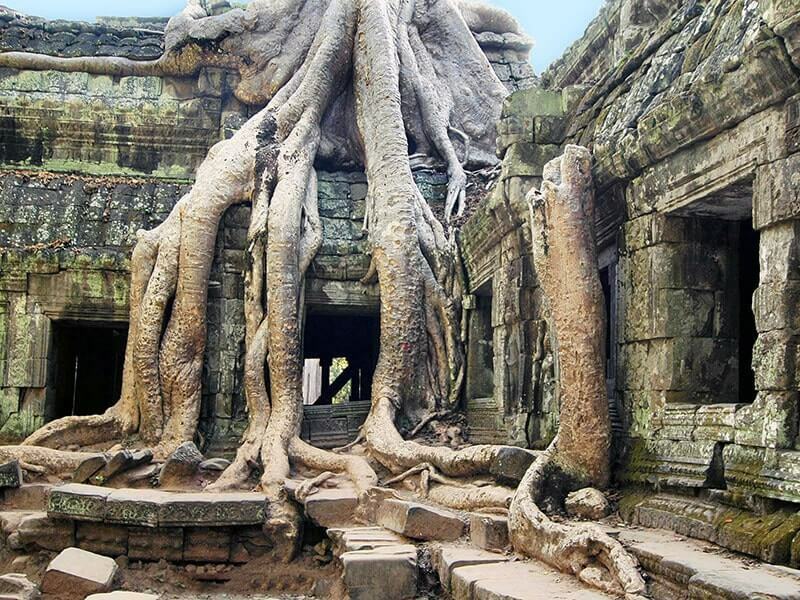 Then, we continue on to Ta Prohm Temple, built about late 12th century to early 13th century by the King Jayavarman VII. Spend time for some refreshment at your hotel as well as to avoid midday heat. After relaxing at your hotel to escape the heat of the midday, enjoy a 20-minute drive from Siem Reap to Kompheim Village then embark on a two-hour walking tour which provides insight into village life in Cambodia. Visit local houses for a firsthand look at how the local villagers live. Get to learn about rice farming and see ox and buffalo while strolling through rice paddies, and interacting with locals. Afterwards, head back to the hotel and spend the rest of the evening at leisure. 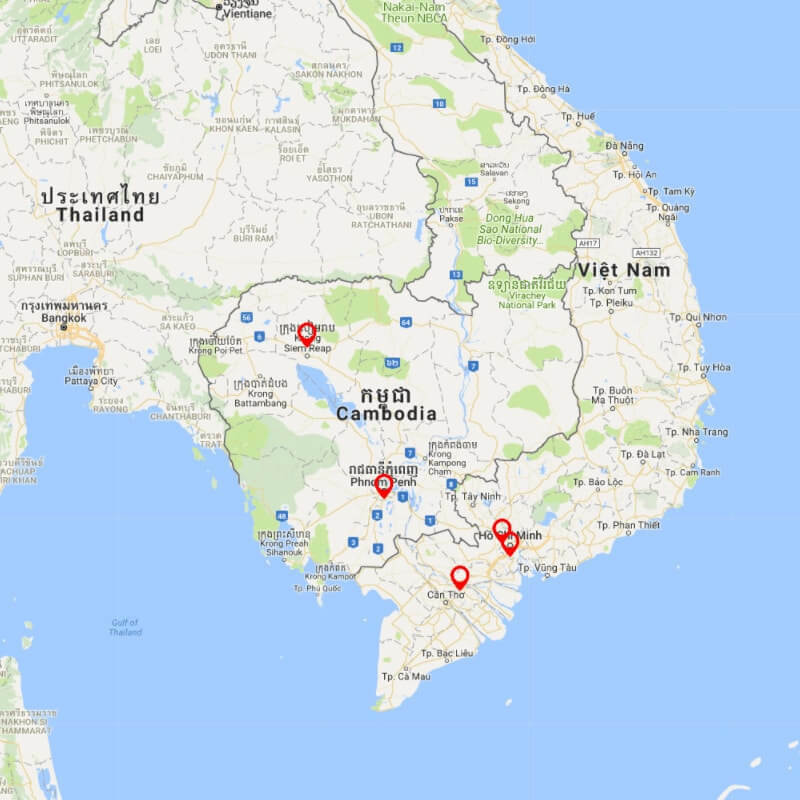 NOTE: By participating the village tour, half the proceeds go directly to a village enrichment fund managed by HUSK, a non-profit NGO that works with communities to improve the lives of Cambodians. 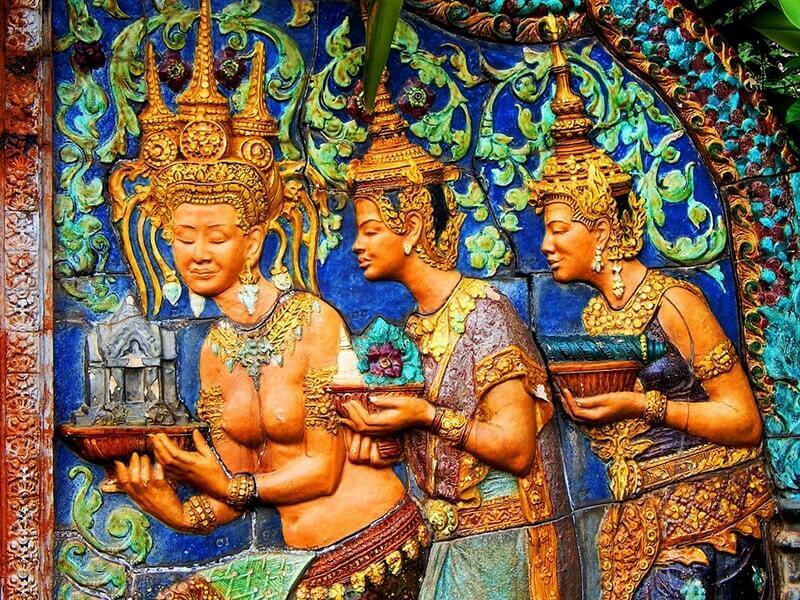 Wrap up your Essential Cambodia and Vietnam tour today. You have visited all the best highlights of Vietnam and Cambodia: picturesque landscape, tranquil villages, ancient capitals, tasty food and cuisines. Free at leisure until your guide and driver transfer you back to Siem Reap International Airport where you will catch your onward flight. 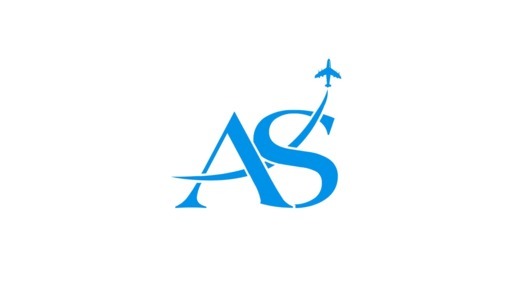 For additional tour options, please read more about other Vietnam and Cambodia tours offered by Asia Senses Travel.